This season moments of rest and relaxation after a good skiing in the Tatras had the taste of herbs. The resort in Tatranská Lomnica and the largest Slovak Apres Ski bar changed their colours for the colours of Becherovka. This season moments of rest and relaxation after a good skiing in the Tatras had the taste of herbs. The resort in Tatranská Lomnica and the largest Slovak Apres Ski bar changed their colours for the colours of Becherovka. For skiers we prepared a cozy place in the relaxation zone under the slope, warm drinks, competitions and concerts. Thanks to Becherovka, Tatra visitors could enjoy after-skiing relaxation throughout the whole season, while sipping a shot of Becherovka, or warm themselves with original Becherovka hot drinks. One of them was the completely new T.L.B. punch, an unforgettable combination of Tatra blueberries with Becherovka. 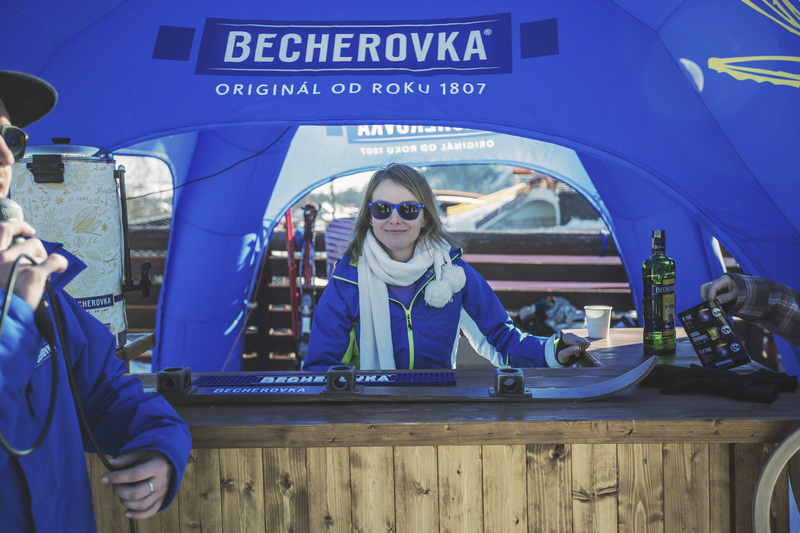 Becherovka prepared various gifts for guests, as well as comfortable sitting bags, racks for skis and an original mirrored photowall through which you could capture moments from a skiing trip and share them on social networks. “Becherovka has always belonged with the mountains and positive reactions of people just confirmed that the Tatras are simply its home,” says the brand manager of the liquor from Karlovy Vary, Zuzka Benková. There were contests and concerts, but we did not forget to raise awareness and education. With the help of a so-called drunken spectacle, Becherovka reminded skiers of the importance of responsibly consuming alcohol. Its place is in an apres ski bar, certainly not on the slope.